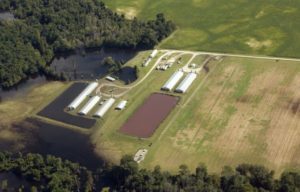 A federal judge recently awarded citizens living near a large (15,000 head) hog-rearing factory in rural North Carolina damages for the nuisance caused by the facility’s open-air waste management processes, in which hog manure and urine is liquefied, stored in giant outdoor cesspools and then sprayed on land near their properties. The lawsuit targeted the owners of the hogs (in this case Murphy Brown, LLC – a subsidiary of Smithfield, which was acquired by the Chinese for $4.7 billion in 2013), not the farmers who are forced to use this ‘lagoon and spray’ waste management practice per contracts. Our North Carolina legislature stepped in this week to help ensure other citizens living with hog feces in and on their homes (legal briefing) cannot receive any compensation from this multi-billion dollar industry, thereby ensuring the industry is not pressured to update these antiquated waste management processes. 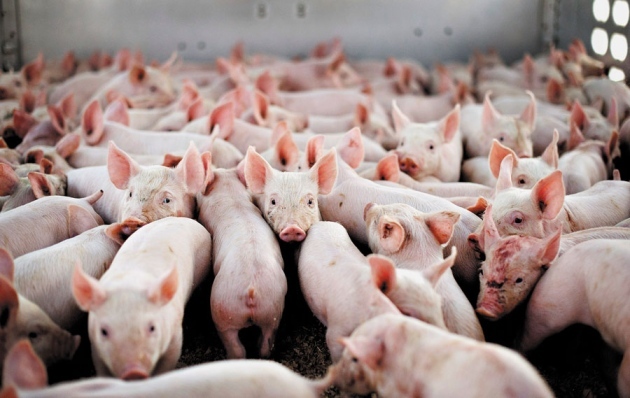 Smithfield invested $100 million in 2017 to upgrade the slaughterhouse in Tar Heel – the largest in the country, in which 33,000 hogs are slaughtered daily. But some seem to think they can’t afford to upgrade their waste management systems. Call your representative in the House and tell them to OPPOSE SB711 – the Farm Act. If your representative is not listed, or you’re not sure who represents you, click HERE and enter your address. Not sure how these corporations affect the lives our North Carolina neighbors and our water quality? Click the image below to watch this short video.